I don’t review everything I read. Not by a long shot. I generally have 3 or 4 books being read at the same time stashed in different places in my house. Today’s book is one that I bought and that I think deserves a wider audience. It begins by separating the idea of nations from states. Nations are essentially groups of people who share a common culture, ethnic language, or historical experience. States can be made up of nations, as in the nation-states of historic France or Turkey, but nations can exist outside of states, such as the Kurdish or Palestinian nations today. American Nations: A History of the Eleven Rival Regional Cultures of North America postulates that North America, including Canada, the United States, and Mexico (at least the northern part), is made up of eleven nations, each with its own unique historical roots, norms, mores, and cultures and that it is the differences between these nations that create the political and occasionally violent turmoil in the region, especially within the United States. The author uses a historical narrative to describe the beginnings of each nation, and specifically the reasons its founders felt it necessary to leave their established homes elsewhere and settle in a new land. Some wanted to create religious utopias. Others wanted to escape the control of tyrants. Still others wanted to find a land that they themselves could control as new tyrants, feudal masters of their own hierarchical kingdoms. Native Americans are not forgotten, but just as in history, they are primarily relegated here to the role of conquered indigenous and their histories and interactions are mostly, but not completely, ignored except to factually and clearly describe the dastardly ways with which native peoples were usually treated. Maps from the book have been published in articles like this one from Tufts Magazine from Tufts University and are worth a look at this point in the description. The linked article also gives a listing and short description of each nation, long enough to give a sense of the idea, but not enough to give the full argument. 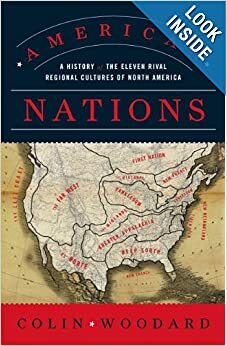 The book has left me with several takeaways, and these are why I think it is worth reading for anyone with an interest in North American, and especially USA history, politics, and culture. Talking about red states vs blue states or Republicans vs Democrats or even The North vs The South forces extreme simplification of more complex issues, beliefs, and trends. Thinking that “everyone in the Midwest” USA thinks or believes the same is naive–this is actually one of the more diverse sections of the country, which is why it always seems to be the power broker or swing voting area. In fact, it has historically been the buffer between the Yankee north and the Deep South extremes of the spectrum on almost every debate. American history is presented very differently to children in each of these national areas. The obvious example is that what people who grew up in Yankeedom call “The Civil War” is called “The War Between the States” in the Deep South and often also in Tidewater and Greater Appalachia. However, this is only an obvious example and are there many less-obvious examples that I didn’t realize exist. The men who made the decisions while creating the United States of America as a state sharply disagreed on many issues and for its first hundred years it was not certain the state would persist. American Nations gives a clear description of each group, its stated motives, and its actions and uses these to dispassionately explain thought and voting trends and more across the areas. It follows these across time as historical events unfold that cause power to rise and fall, especially as the nations expand geographically and how each chose to do so–note, each nation did so very differently from the others. The intent is to help the reader grasp the layers of meaning, communication, alternate understandings and perceptions of events that make up the continent and especially the United States. Knowing this helps both the insider and the outsider grasp the difficulty inherent in trying to unite people across the nations toward any common goal. As a supplement to a typical (lacking) education in North American and especially American history, I consider this book a quality companion to Howard Zinn’s A People’s History of the United States; this book is less political, but I don’t think it will be less transforming for the reader. Disclosure: I was NOT given my copy of this book by the publisher as a review copy. See also: Are All Book Reviews Positive?